I’ve been making these for years and years for my kids. They are super easy to put together, and I always have the ingredients on hand. I was even able to resist changing anything from the original recipe that I found in a 2004 Cooking Light. Yep, I messed with it. I decided to throw a handful of white chocolate chips into the batter for fun. 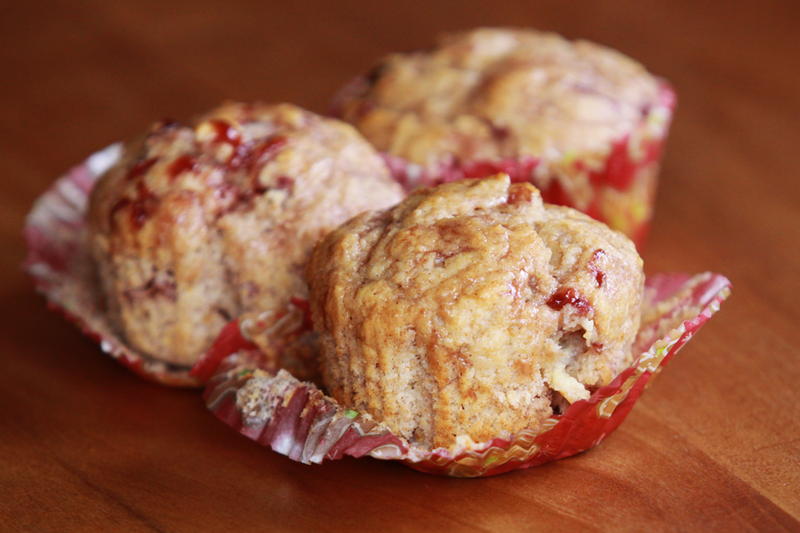 How can you not love Strawberry Jam Muffins with White Chocolate Chips?! There’s no going back now. And, yes, I do always have white chocolate chips in my pantry as well. I know, I know. I truly do feel ashamed. Whether you throw the white chocolate chips in or not, these muffins deserve super-yum, high-quality, lumpy-bumpy-fruit-filled jam. Kirkland Organic Strawberry is a great choice. And, of course, any homemade freezer jam is fabulous. I’ve used blueberry, strawberry-raspberry and even raspberry-currant. If you skip the white chocolate chips, a nice touch is to sprinkle a mix of 1 Tbsp sugar and 1/2 tsp ground cinnamon over the top of the muffins before baking. I always keep a little shaker of cinnamon sugar in the pantry. Step 2: Insert 12 paper lines into a muffin pan. Step 3: Combine flour through salt in a mixing bowl. Step 4: Create a well in the middle of the dry ingredients. Whisk in the egg then add in yogurt, melted butter and milk. Step 5: Stir or lightly mix with a mixer the wet and dry ingredients just until moist. Step 6: Gently fold in strawberry jam and white chocolate chips. It should look like a strawberry ribbon weaving out rather than strawberry colored batter. Step 7: Spoon batter into muffin cups. Each will be about 2/3 full. Step 8: Bake at 375°F for 15 minutes or until muffins are golden brown and spring up when lightly pressed with your finger. Step 9: Cool muffins on a wire rack for 10 minutes. Remove from pan and wrappers and enjoy!